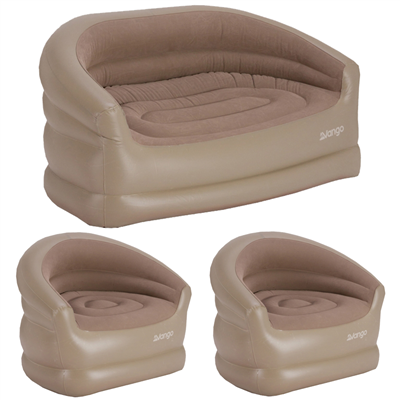 The Vango Sofa and Chair Suite is exclusive to Camping World. The best-selling sofa is paired with two matching single chairs giving comfort and relaxation for all the family at unbeatable value. We bought this set online late Monday evening and it arrived on Wednesday morning. I had a problem with one of the chairs and after quick email correspondence a replacement chair was sent out which arrived the next day. Cannot fault anything about the service of Camping World. Hope the actual Vango product delivers over the next few years... so far so good... very comfy upon testing. Parcel arrived on time and well packed. Easy website to navigate and kept uptown date from ordering to delivery. Will definitely use again. Product is excellent value for money and comfortable. Great quality and really comfy.